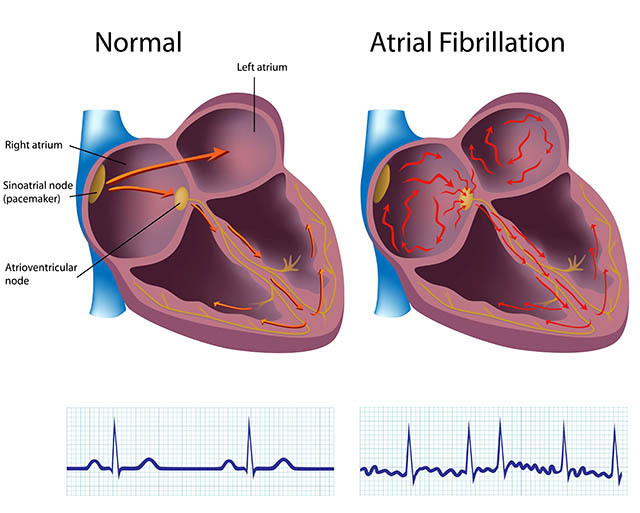 The most common arrhythmia we manage is an irregular heart beat called Atrial Fibrillation(Afib). This condition is typically seen in patients after age 60, but can occur in young adults as well, especially in patients who have a thyroid disorders, obstructive sleep apnea, valvular heart disease or a strong family history of arrhythmias. As many as 4 million people in the US may have AFib, but since few people can sense their heart’s beating, most may be unaware of their heart rhythm disorder. While the sense of the heart’s irregularity may be hard to detect, many patients notice a decrease in energy level, increased shortness of breath or decrease in their exercise capacity, and while they cannot point to their heart as the cause, they know that something is wrong. When the upper chambers of the heart are beating irregularly, they are not squeezing normally. This absence of function causes a decrease in heart muscle efficiency and is the cause of symptoms such as those listed. Also, as blood is not pumped efficiently out of the upper chambers during AFib, slow moving blood can form blood clot. Due to the possibility that blood clot in the heart can exit and be sent to the brain, it is well known that patients with AFib are at an increased risk for stroke. The first line of treatment in most patients are medications such as warfarin to reduce that risk of stroke. Blood thinning drugs help prevent the formation of blood clots in those patients that are experiencing an irregular heartbeat. Other medical treatments include medications that prevent AFib from racing, or stronger antiarrhythmic medications that may make AFib happen less often, be less intense, or last less long. However, for many patients, medication comes with significant lifestyle drawbacks and side effects. Further, drugs do not treat the source of the problem, rather masks the symptoms. For those who do not wish to take these medications or for whom the medication is not effective, there are several alternatives. One of the more recent and advanced breakthroughs in Afib management is known as cardiac catheter ablation. This is a minimally invasive procedure whereby an electrophysiologist will thread a tiny catheter from an IV in the groin, up a blood vessel and in into the heart. The very tip of the catheter serves two purposes. First, combined with advanced imaging technology, it maps the heart, and in most cases effectively determines the origin of the irregular heartbeat. If the diagnosis is successful and treatment is possible, the catheter can also emit energy to heat that abnormal tissue in order to ablate (destroy) the abnormal heart muscle causing the irregular heartbeat. This procedure is performed in a specialized cath lab at the hospital and requires very little downtime, with most patients getting back to normal activity within just a few days of the procedure.